Cut the carbs with this Pressure Cooker Chicken Shawarma made with spices you probably already have in your cupboard. 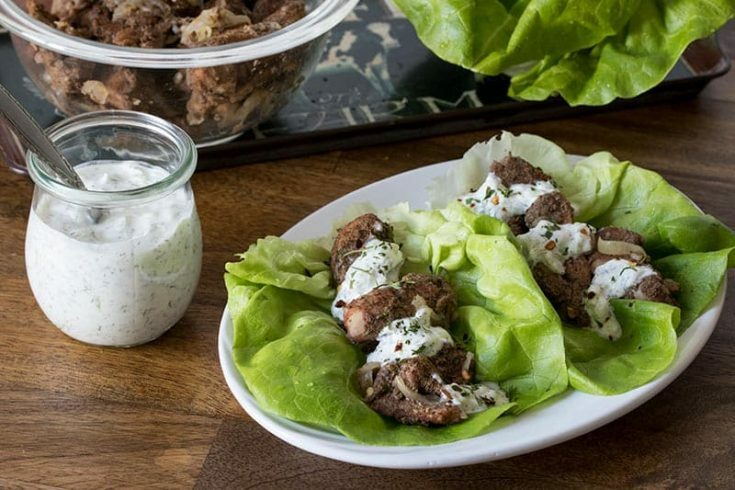 A Middle Eastern meal, tender chunks of seasoned chicken thighs are served on lettuce leaves with Tzatziki sauce. This was my first time eating Shawarma. We often have Gyros, and I have a great Pressure Cooker Greek Taco recipe, but I don’t eat Middle Eastern food as often. If you’ve never eaten Shawarma either, it’s made with warm spices like cinnamon allspice, and cayenne. Today’s recipe is from a new cookbook, The Keto Instant Pot Cookbook, by Urvashi Pitre. Urvashi also shares recipes and how-to-videos on her blog, Two Sleevers. 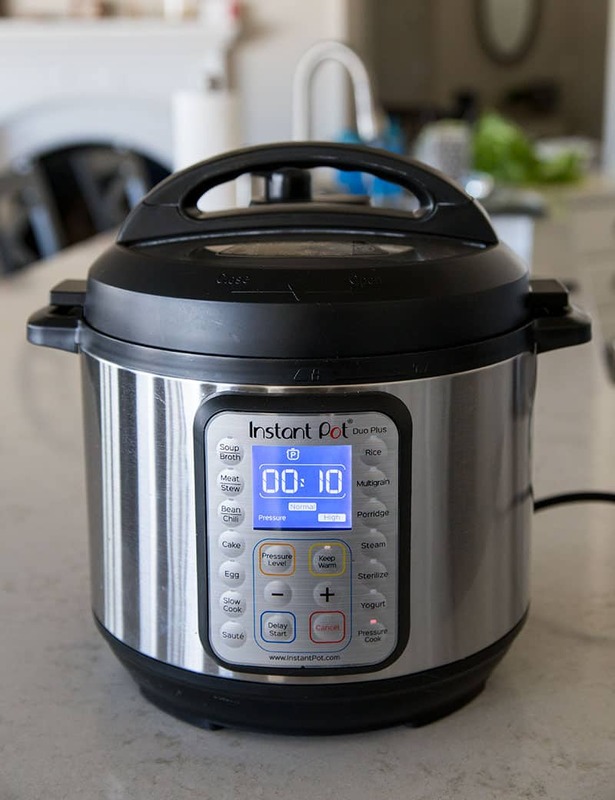 In September I posted a Pressure Cooker Beef Curry recipe from Urvashi’s first cookbook, Indian Instant Pot® Cookbook: Traditional Indian Dishes Made Easy and Fast which has been super popular. In the new cookbook, she brings together her love of pressure cooking and her success with the Keto diet. The recipe couldn’t be much easier. Other than the spices, all you need for this recipe is chicken thighs and onions. You could substitute chicken breasts if you prefer but chicken thighs in the pressure cooker come out so much more tender. I recommend if you haven’t tried chicken thighs yet in the pressure cooker that you do it. The fat melts away from the meat and you’re left with tender juicy meat. The recipe starts by sauteing the chicken. Be sure and pre-heat your pressure cooker. 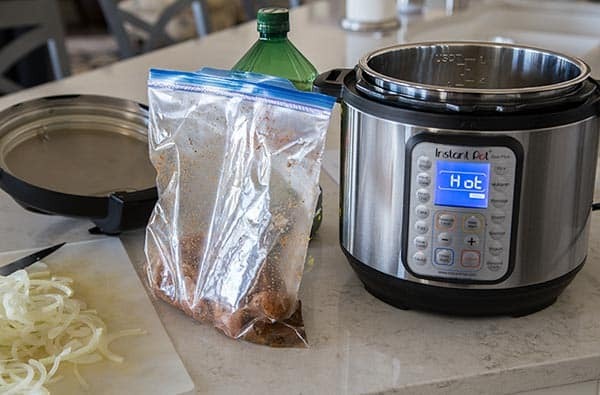 The Instant Pot actually says Hot on the display when the pressure cooker is pre-heated and ready to saute. I made a few changes to the recipe. I doubled the amount of chicken in the recipe and it made 8 lettuce wraps. However, I did not double the spices and while we like things spicy, it was still too spicy for us. Next time, I would cut the spices in half. If you don’t like much heat at all, I would just use a dash of cayenne. The recipe uses a 10 minute cook time, which was just perfect for chicken thighs. If you’re using chicken breasts, you may want to reduce the cook time to 5 minutes. To be Keto friendly the cookbook recommends serving them as lettuce wraps. If you’re not trying to cut carbs, serve it on a warm pita. Despite the fact that the Chicken Shwarma was a little too spicy for our liking, we really enjoyed it especially with the tzatziki sauce to cool it down. 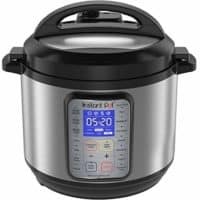 Although I don’t follow a Keto diet, I do often like to reduce my carbs and there’s lot of recipes in The Keto Instant Pot Cookbook that my family would enjoy and I look forward to trying. I hope you’ll give this Pressure Cooker Chicken Shawarma a try. Put the chicken in a zip-top bag and add 1 teaspoon of olive oil and the spices. Toss the bag so the chicken is evenly coated in the oil and spices. Preheat the pressure cooker. When the inner cooking pot is hot, add the remaining 2 teaspoons of oil. Add the chicken and saute for about 4 minutes stirring occasionally. Add the water and scrape up any browned bits from the bottom of the pot. Add the onion and stir to combine. Lock the lid in place. Select high pressure and 10 minutes cook time. When beep sounds turn pressure cooker off and use a quick release to release pressure. When valve drops carefully remove lid, tilting away from you to allow steam to disperse. 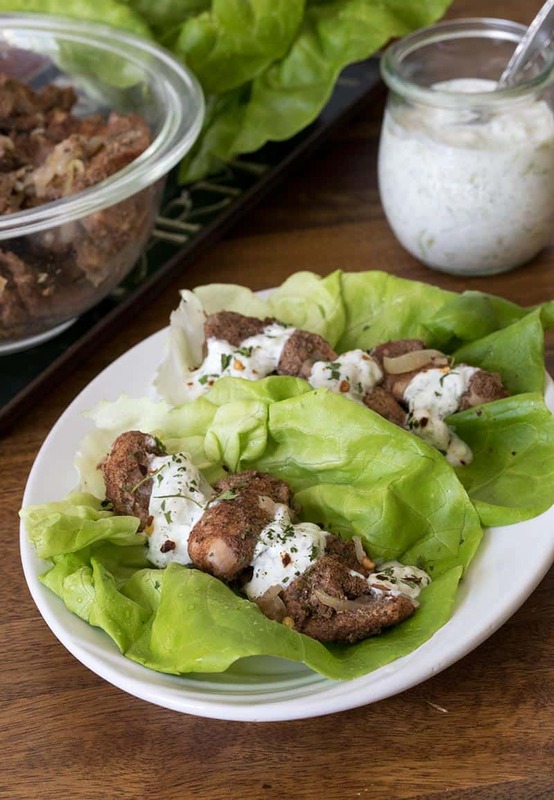 To serve, wrap the chicken in the lettuce leaves and serve with the tzatziki sauce. Or, serve on a warm pita. Made this today and it is delicious! Will definitely be making again and again! Thanks so much for sharing! Thanks Gloria – glad it was a hit! I made the shawarma, yesterday. It was delicious and so easy to make. Thank you. If I want to triple the recipe do I have to increase the time from the three minutes I used? Also, do I have to increase the amount of water? Thanks – glad it was a hit. No need to increase the time nor the water when increasing the volume. You’d only increase the time if the thickness of the meat was changed. Barbara, since Garam Masala is comprised of many of these dishes, can it be substituted for the spices listed? If so, what amount would you recommend? Thanks! Middle Eastern Food is my favorite. This is hands down the best shawarma I have ever had! We loved it! Chicken shawarma is often dry or over cooked, but not like this. My new favorite Instant Pot recipe followed by your fabulous Mexican Macaroni and Cheese (which was a favorite of my son’s football team at the weekly potluck:). Thanks for the great recipes. Tonight we’re trying your Pressure Cooker Au Gratin Potatoes, you’re cute video makes them look like a snap to make. Thanks great Jana – thanks!! Barbara, This was so good. My family loved it. Thank you for sharing it. Ooh, ooh! It looks really good, and my husband might even eat this with me. I actually don’t even have cayenne in my cupboard, I use aleppo instead. It’s still spicy, but quite a bit cooler than cayenne. I made the butter chicken from Ms P’s first cookbook and it was crazy-hot. I guess I will be reducing the heat in all of her dishes. Barbara, The first time I had shawarma was at the FarmersMarket at the Grove in LA. Wonderful wonderful! Barbara, this looks delicious & can’t wait to try it! I’ll have to get allspice first, but on my grocery list. I’ve never had shawarma but first heard about it in the ‘easter egg’ at the end of ‘The Avengers’ movie, wondered what it is, – how lame is that, lol! Love spicy hot, so will go full on with spices my first time out. Thanks for sharing this recipe & you’ve inspired me now to try other recipes in this cuisine! And I get to use the yogurt I just made in my Instapot for the first time. Hi Jan – sounds like perfect timing! Enjoy!